Oblique Projections: Mount Union Community Auditorium - Done! 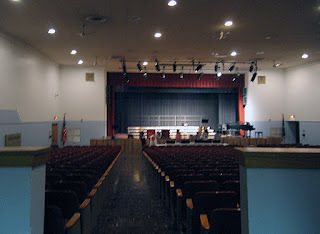 Mount Union Community Auditorium - Done! Last week after a daylong series of contractor substantial completion closeout meetings at the Mt Union High School, I heard singing in the distance and decided to investigate. What I found was their new performing arts center in use for final spring concert practice. This was the first time since the project was completed in March that I had the opportunity to hear the acoustics of the hall. Although we have designed a number of performing arts venues - this one is special as it is a remake of a space constructed in 1952 and never updated - and happened in one of the poorest PA School Districts. Besides having a full digital backbone for sound/lighting/video the rebuilt space features a "continental style" seating arrangement without aisles that provides increased seating and maximizes the "good seats". Mt Union has always been the poor relative in central PA school Districts - hearing the kids stellar vocal rendition and seeing the space this community has nothing to be ashamed of now. Mission accomplished!